It's always 4:20 somewhere, might as well be in your home garden! 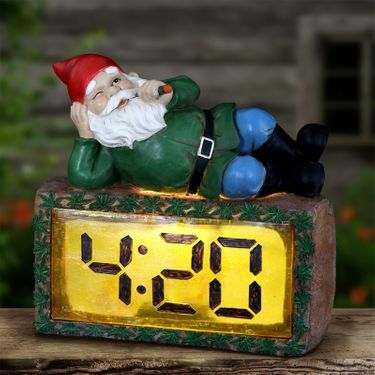 Enjoy this Good Time Pot Smoking Gnome laying on a LED 4:20 Clock all day long. Simply set the battery timer and the LED light will automatically illuminate at your desired time each night. To each their own, enjoy in your medicinal or recreational garden! Size: 4.5" x 10" x 10" H.